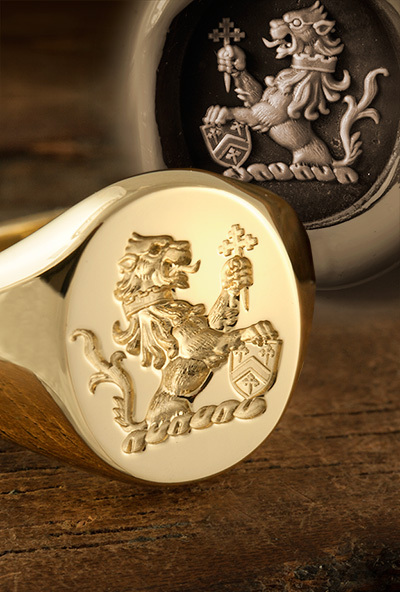 If you order today we will confirm your crest artwork with you prior to commencing any work. 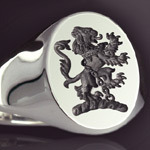 If you don’t have a crest, we will make suggestions. 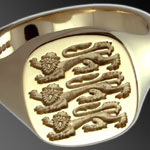 If you don’t like any on offer you can suggest your own or obtain a full refund. 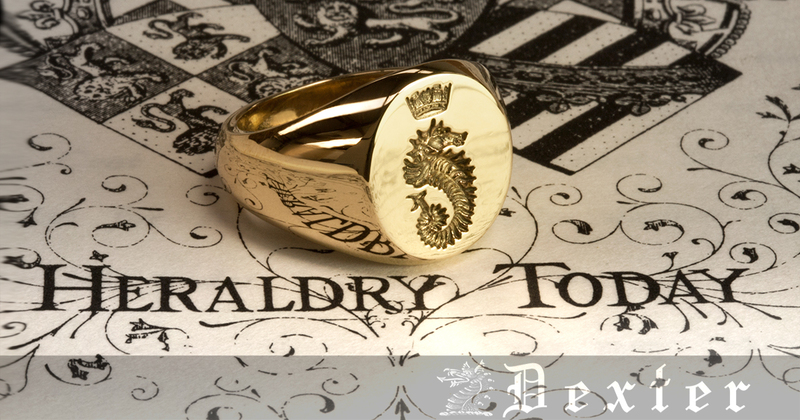 If you do not know your crest, please use our personal crestArchive service. 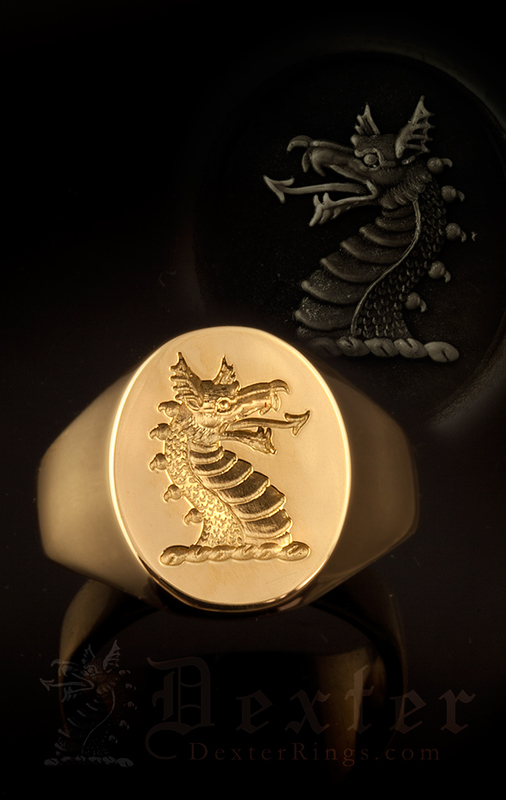 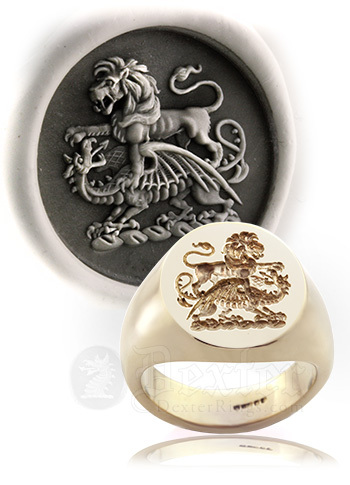 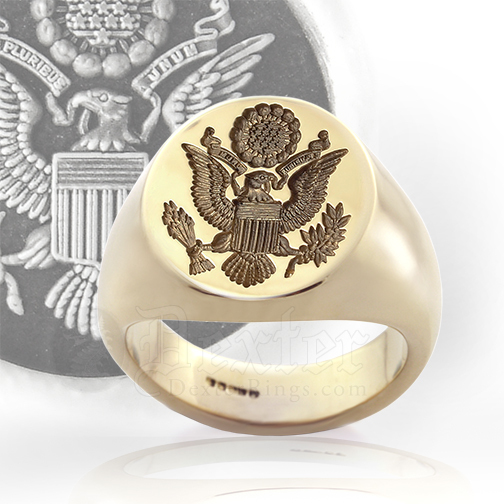 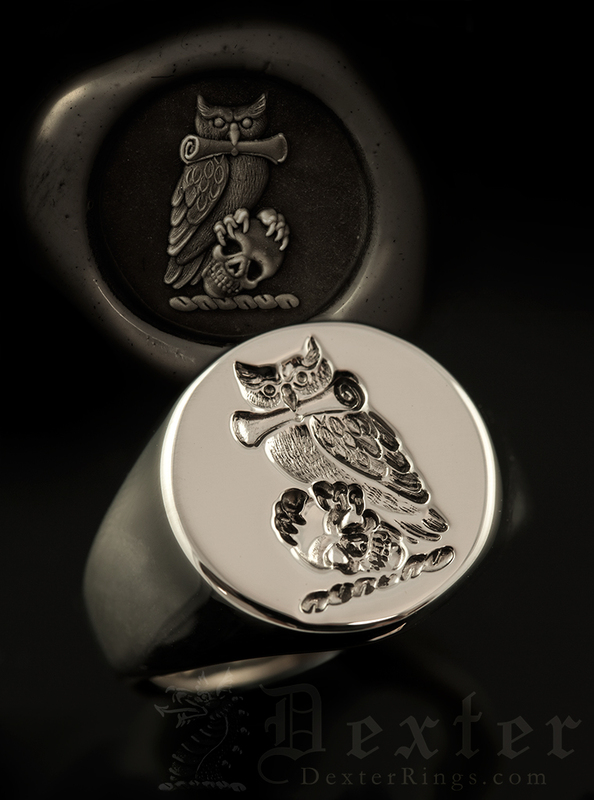 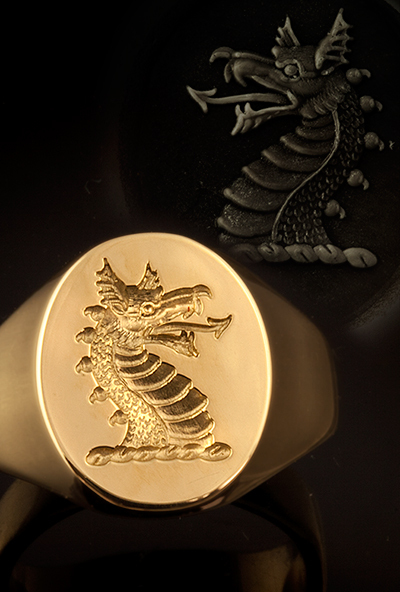 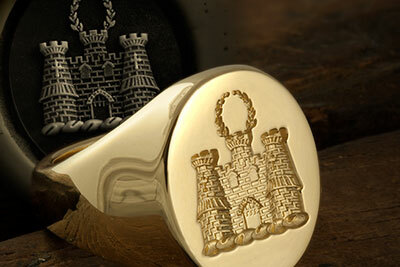 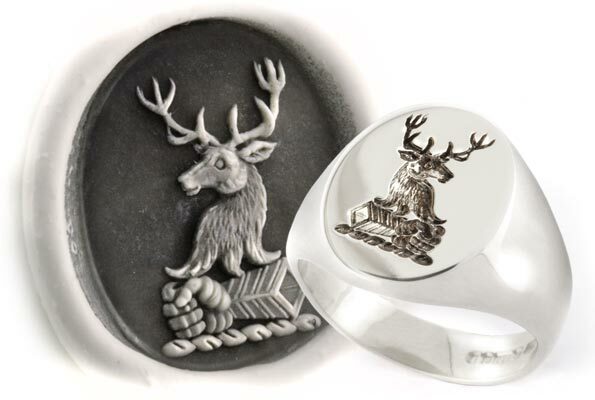 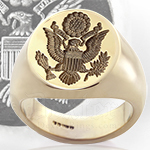 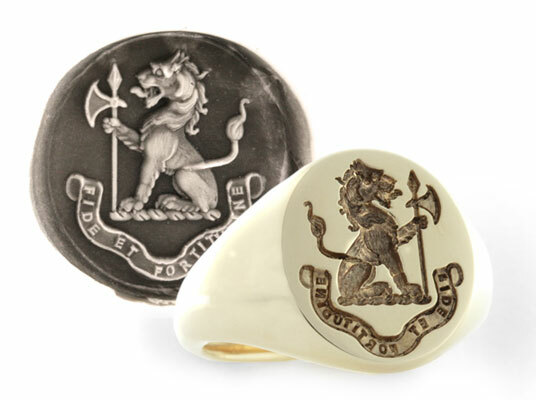 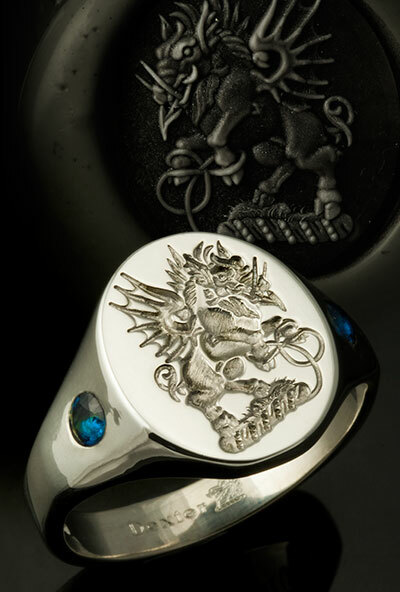 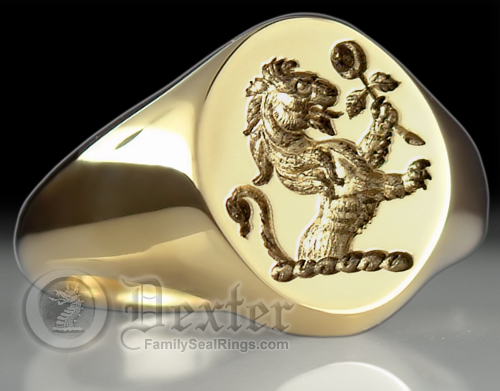 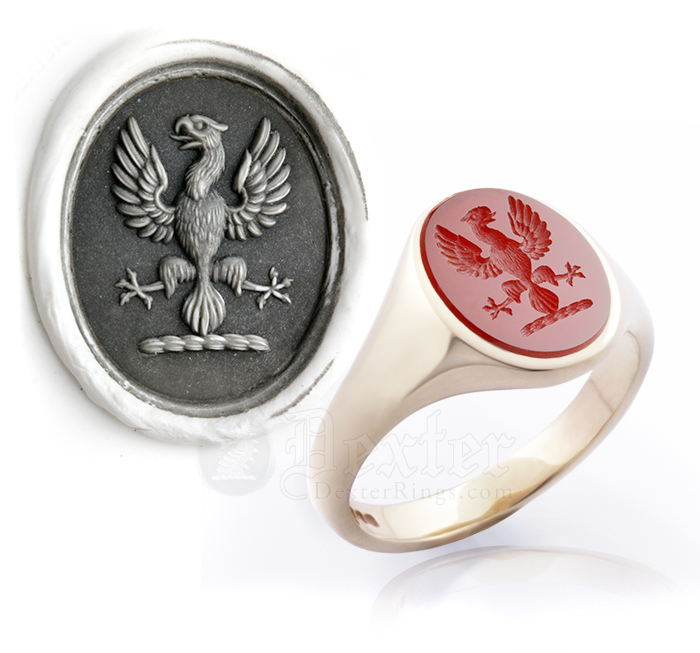 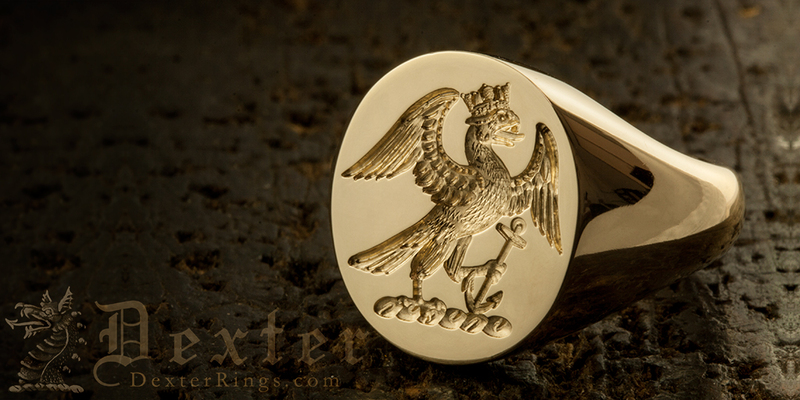 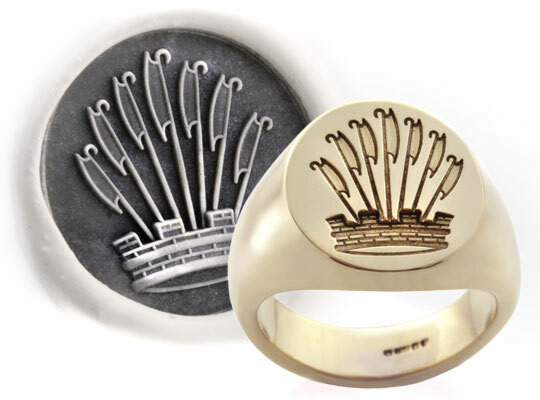 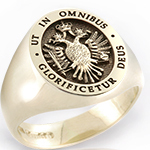 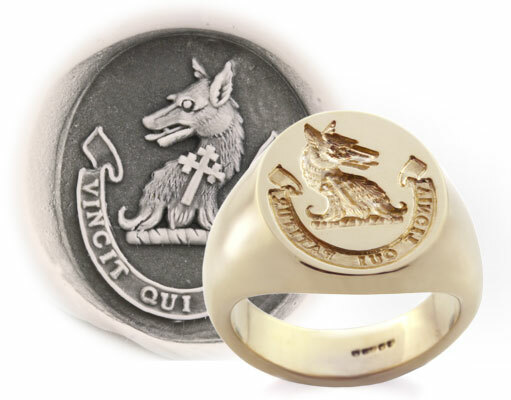 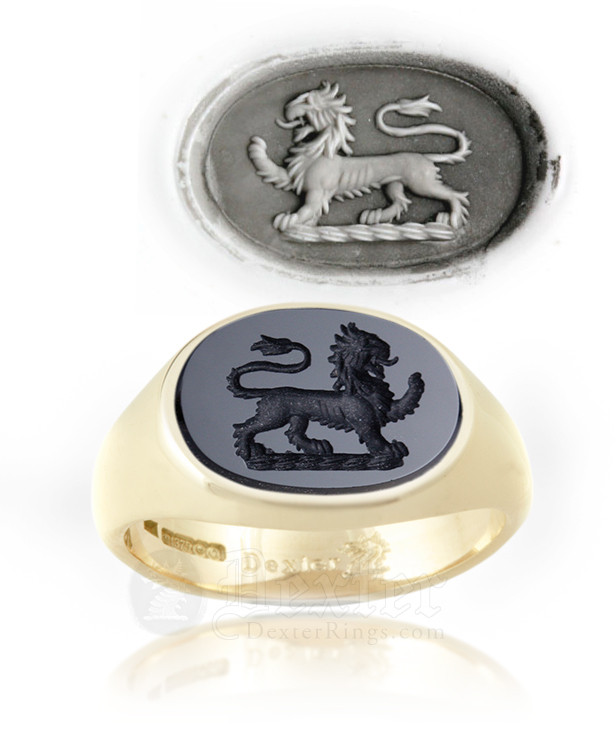 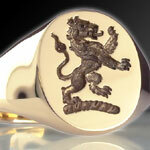 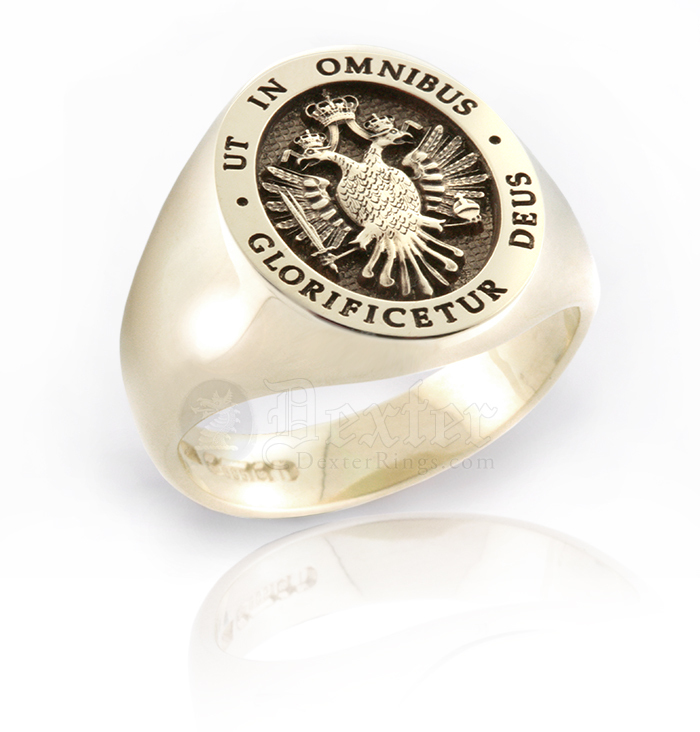 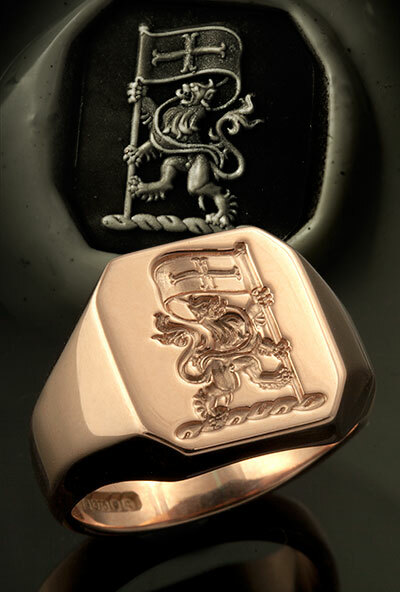 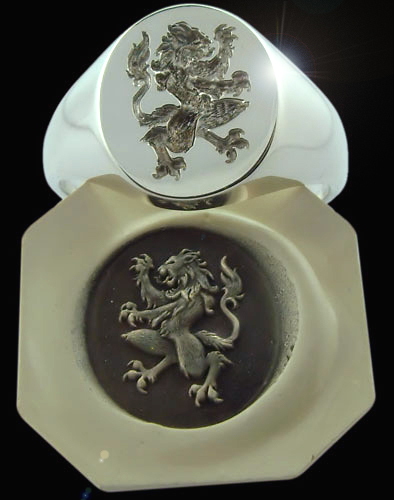 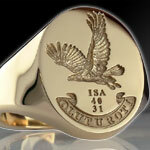 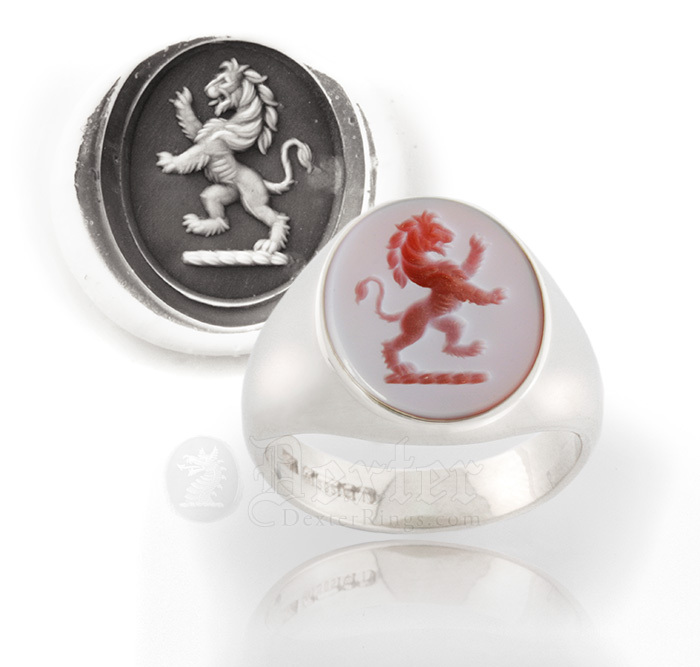 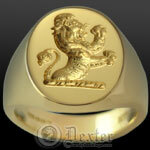 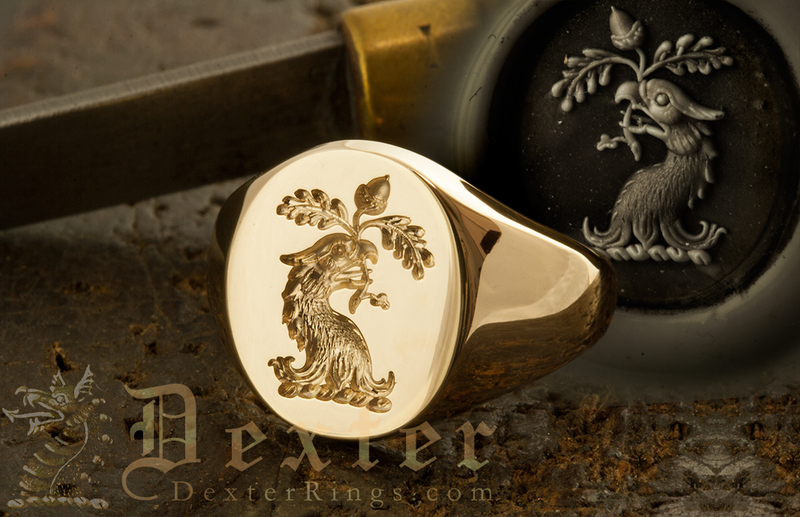 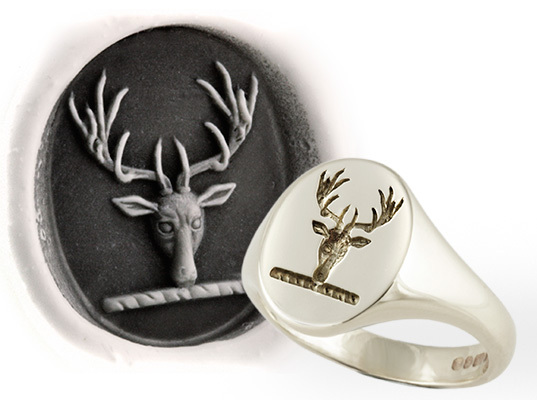 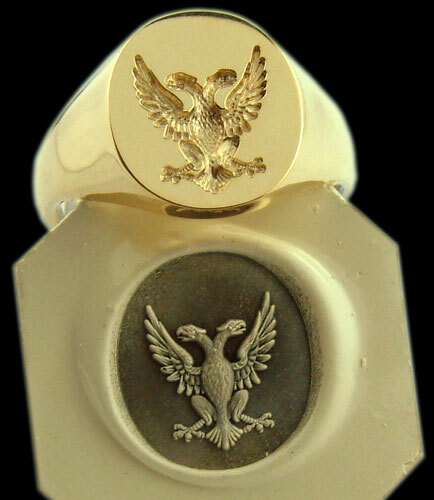 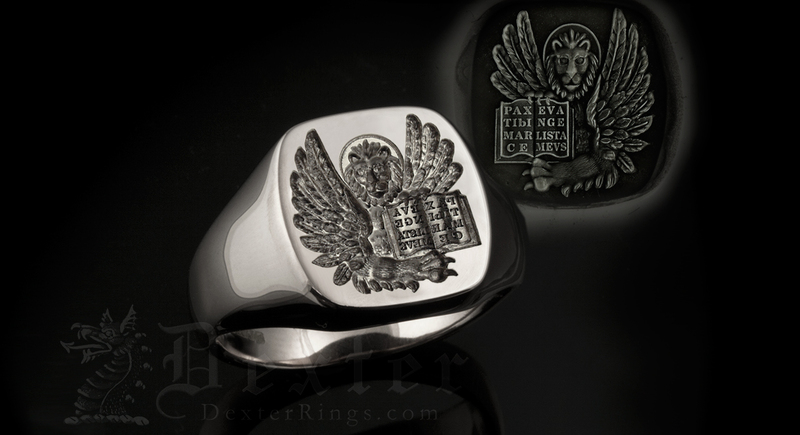 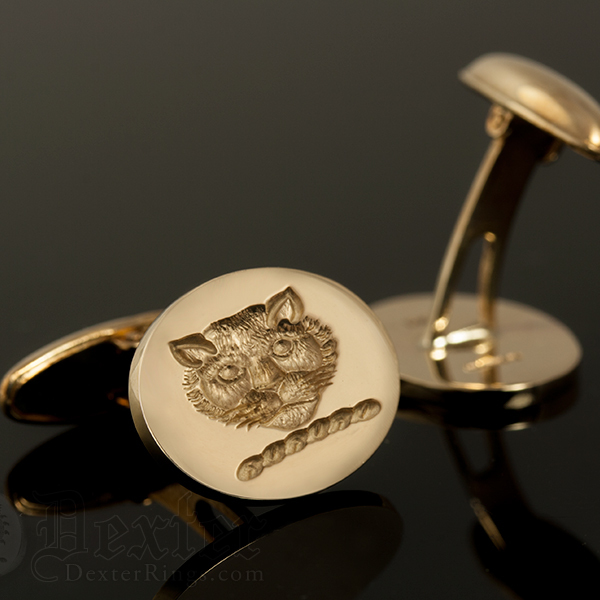 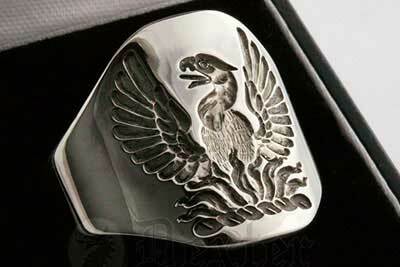 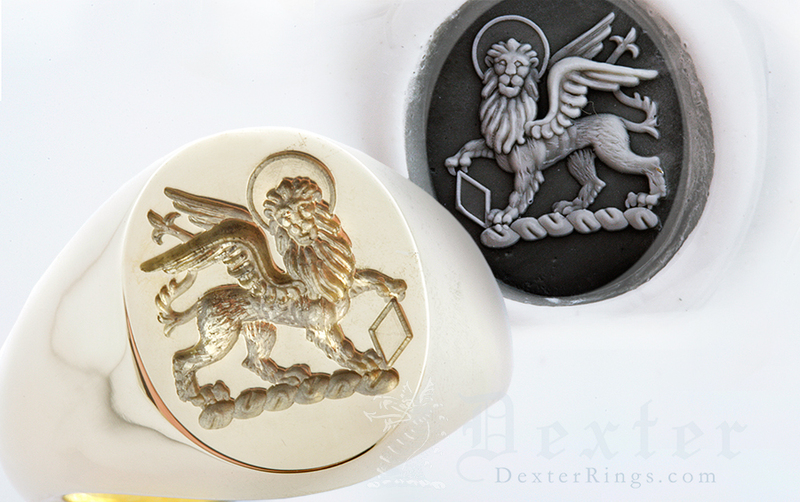 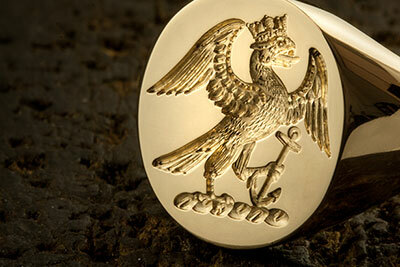 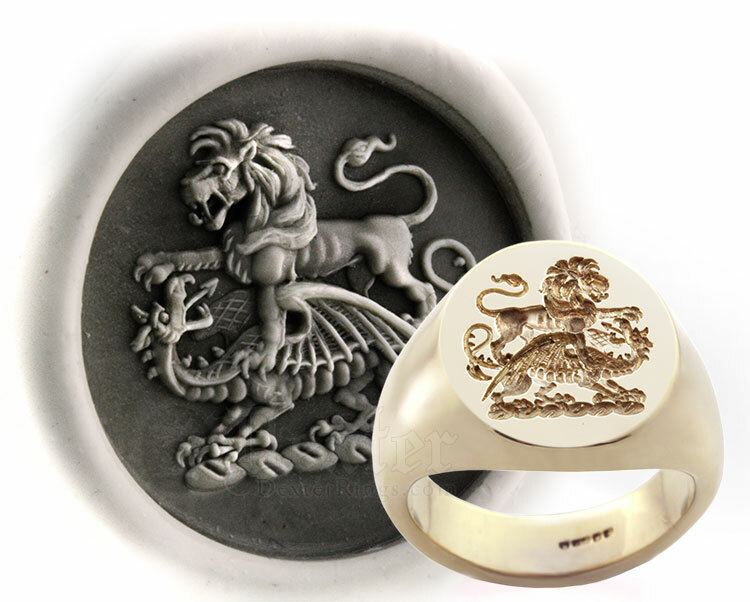 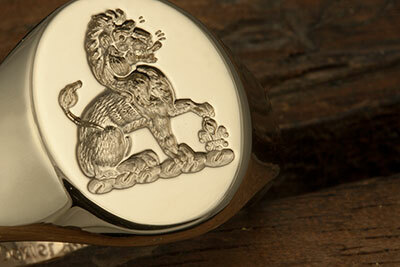 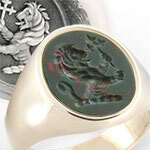 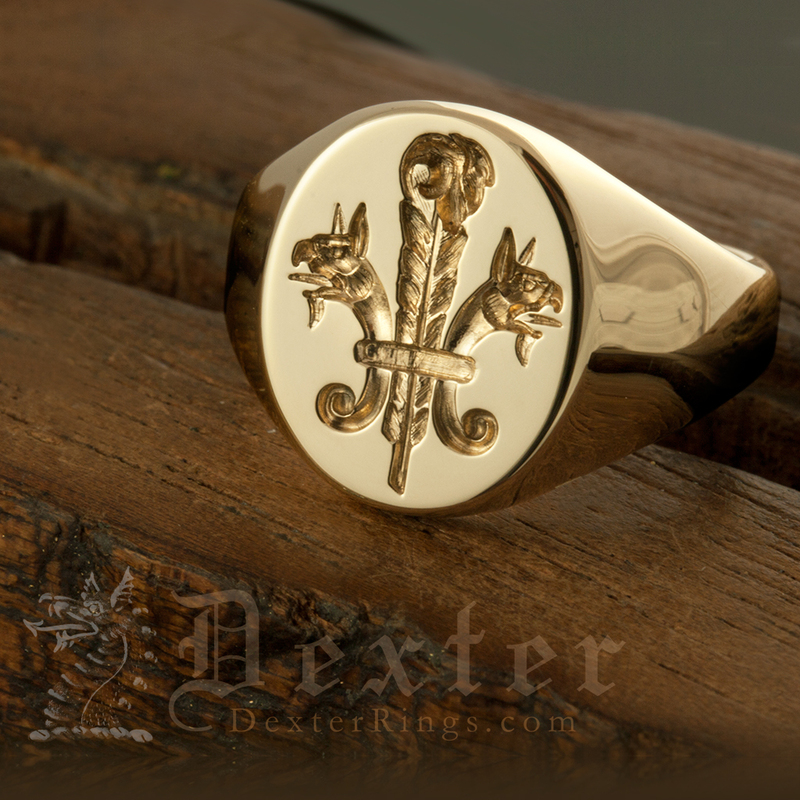 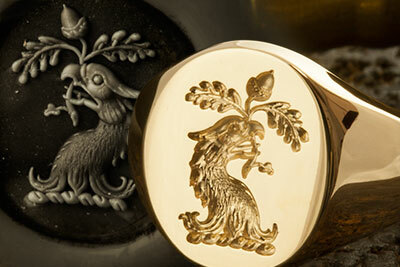 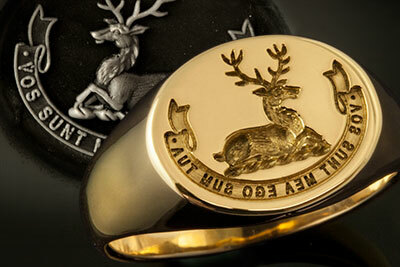 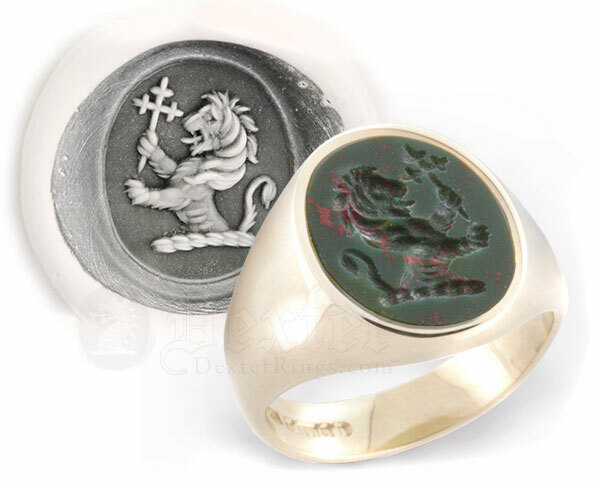 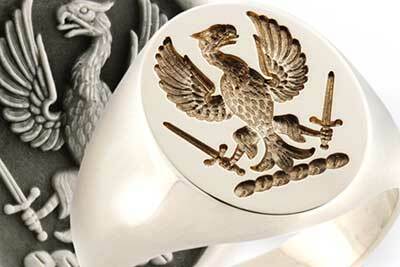 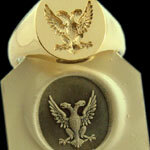 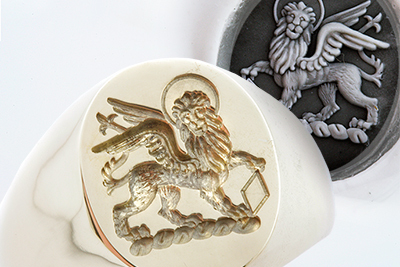 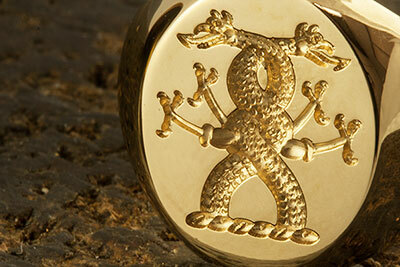 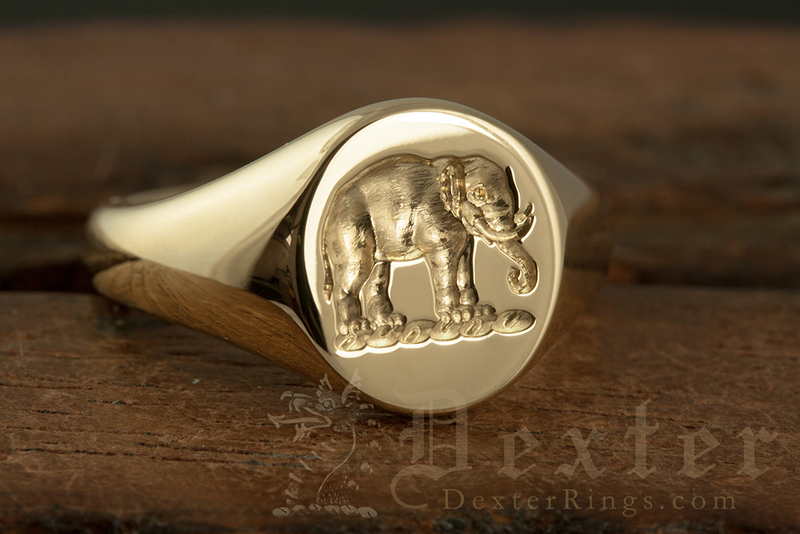 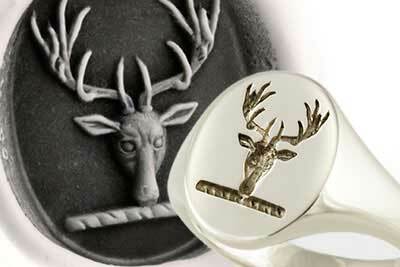 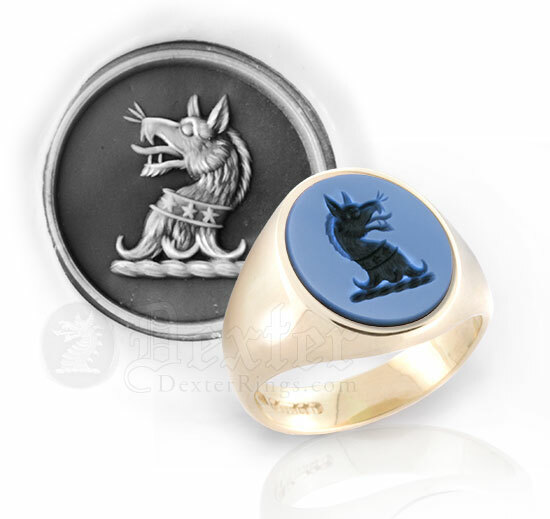 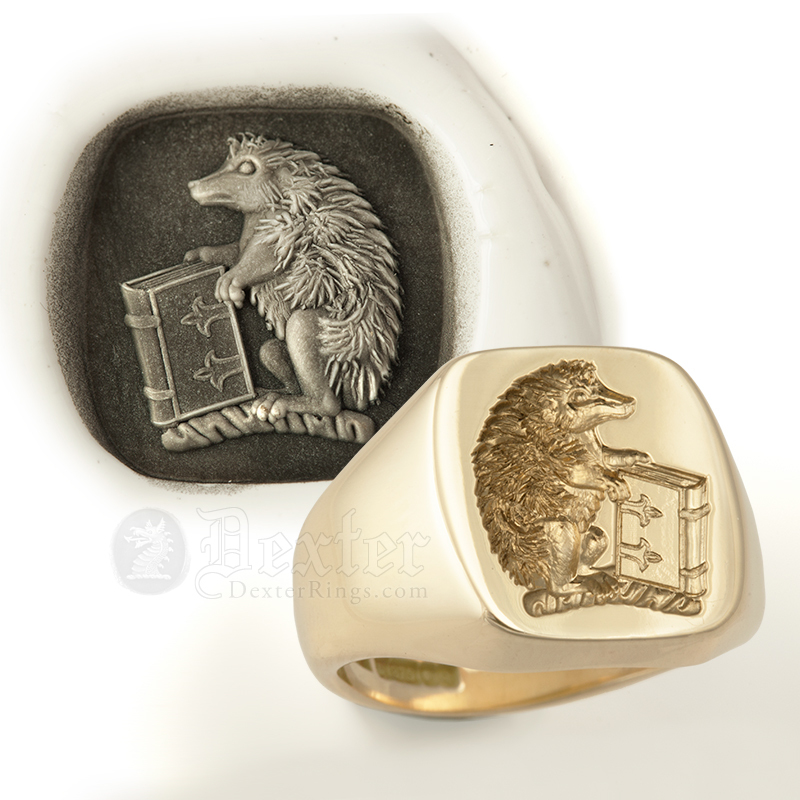 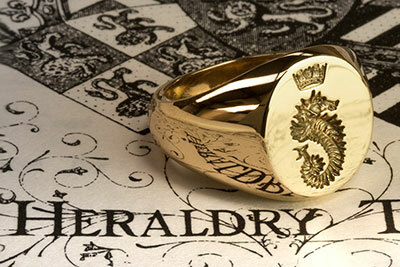 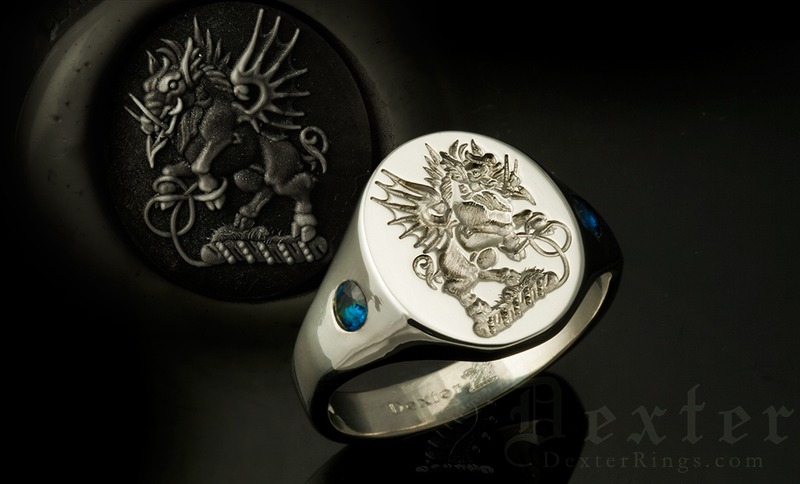 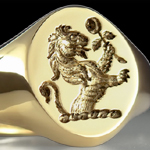 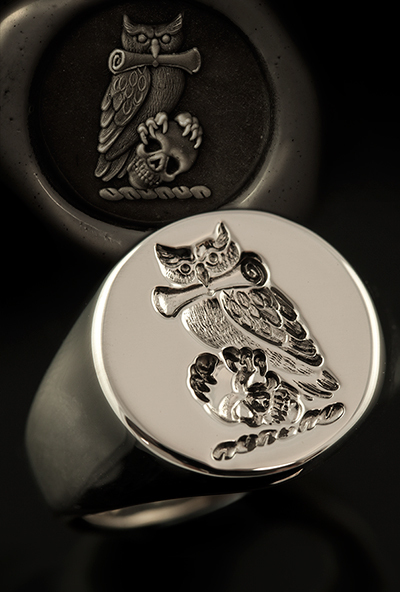 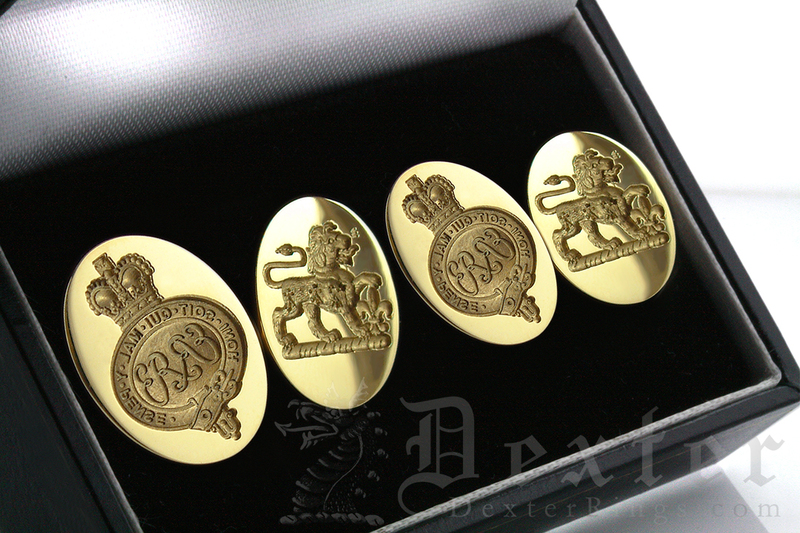 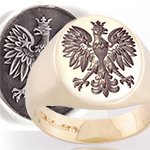 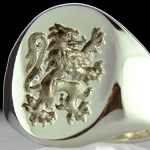 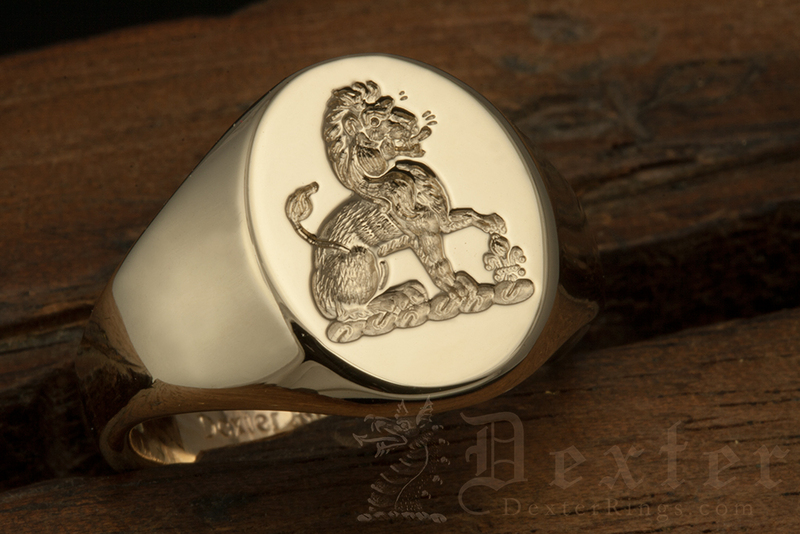 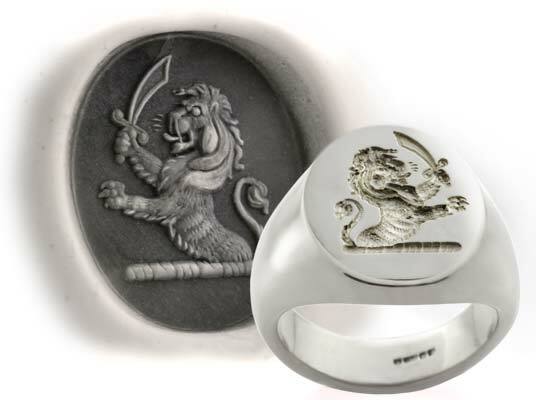 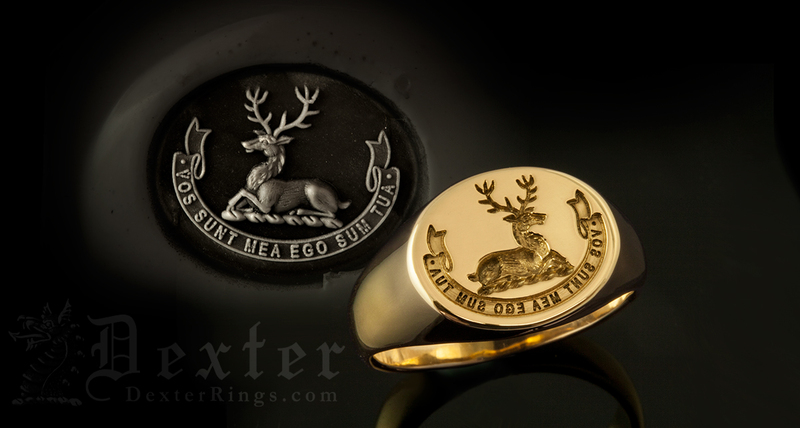 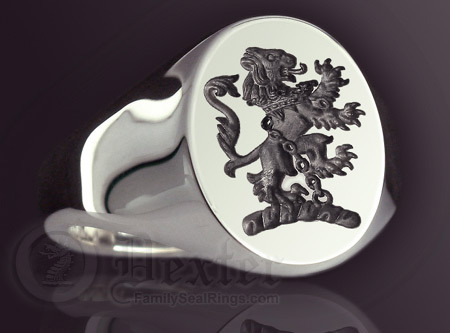 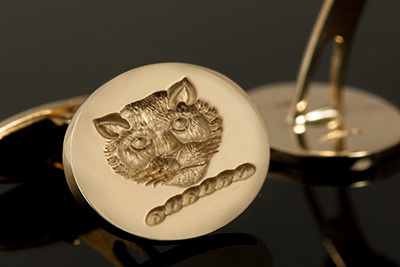 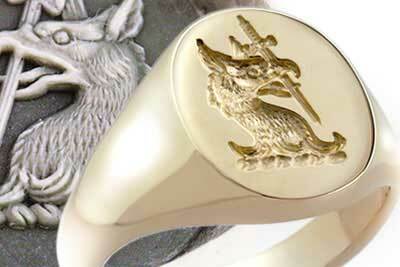 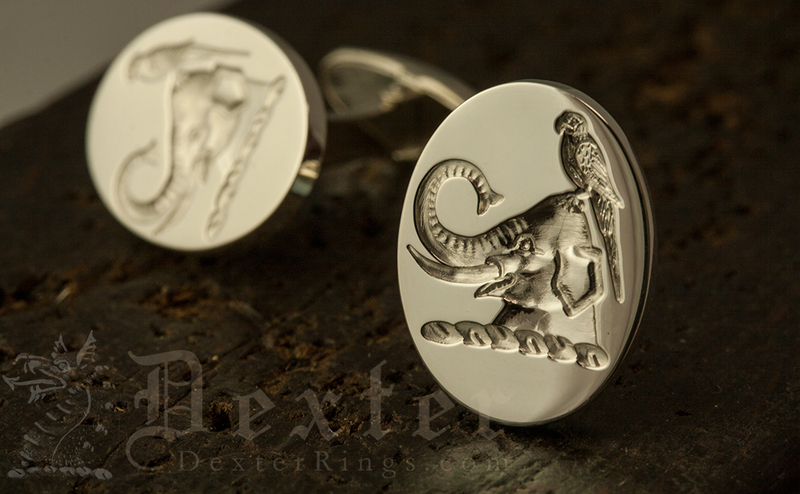 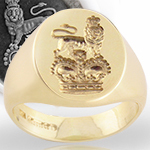 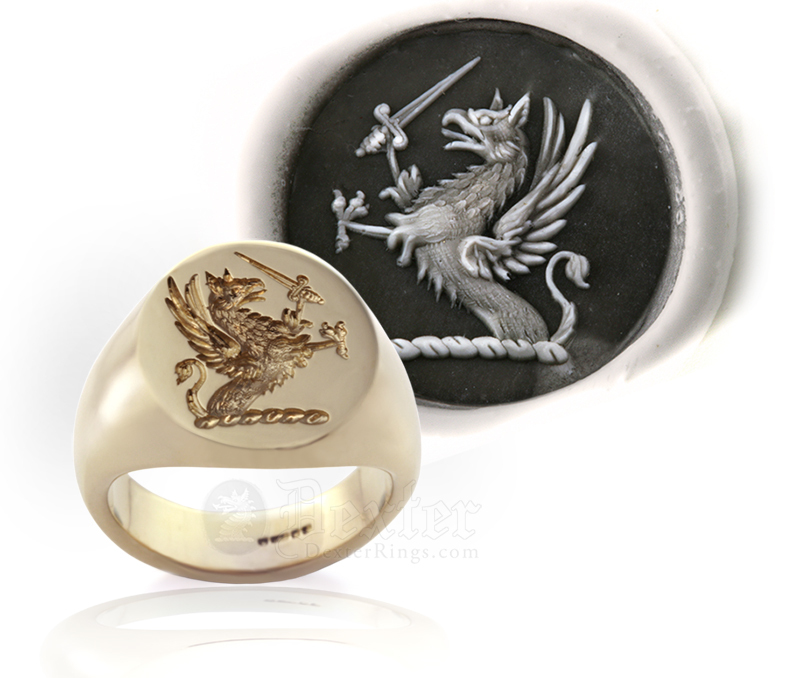 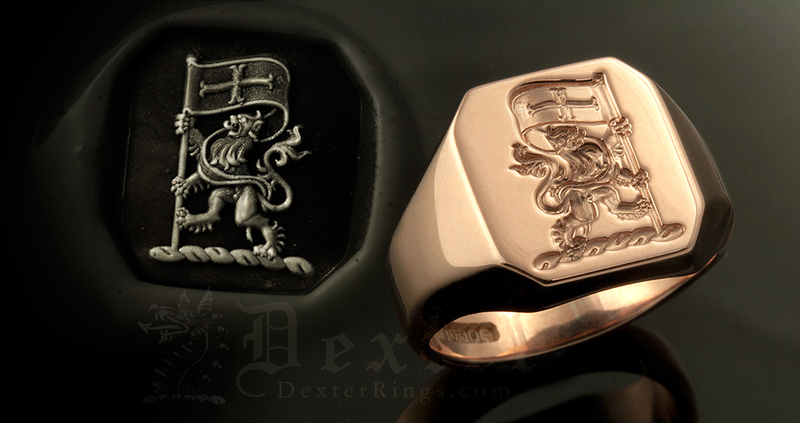 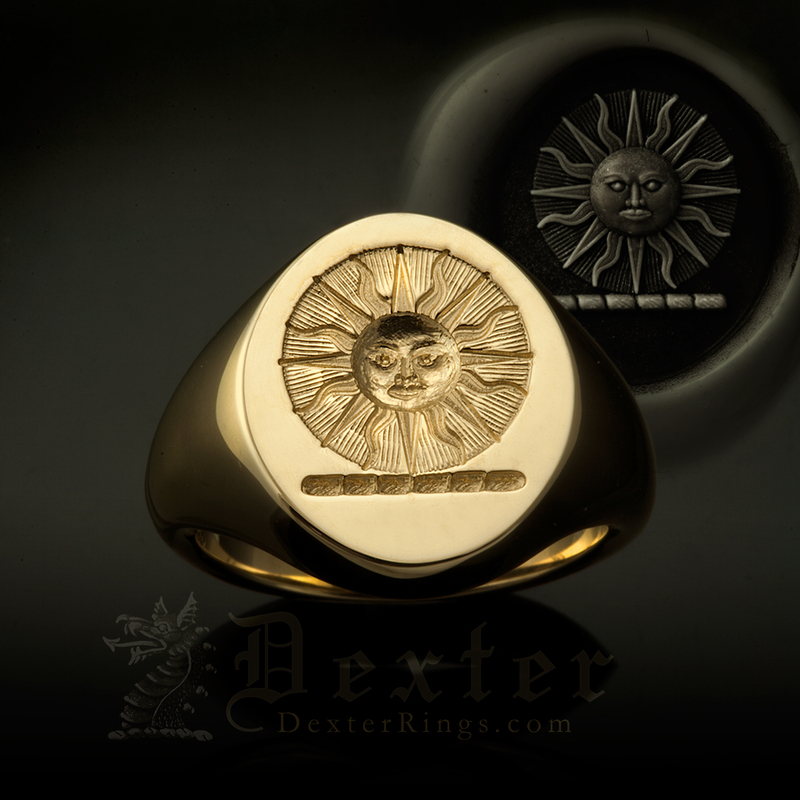 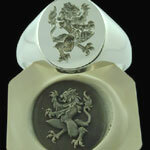 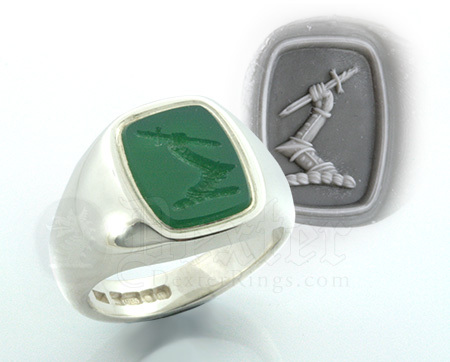 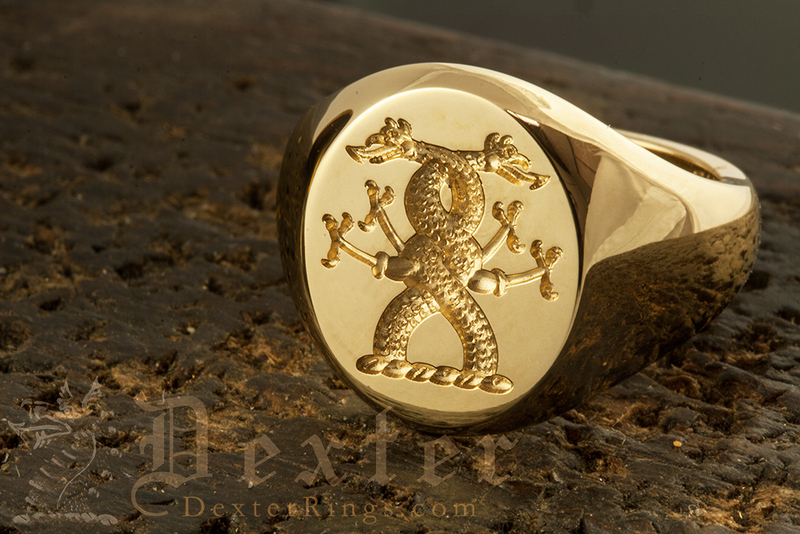 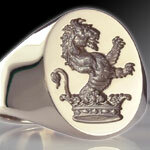 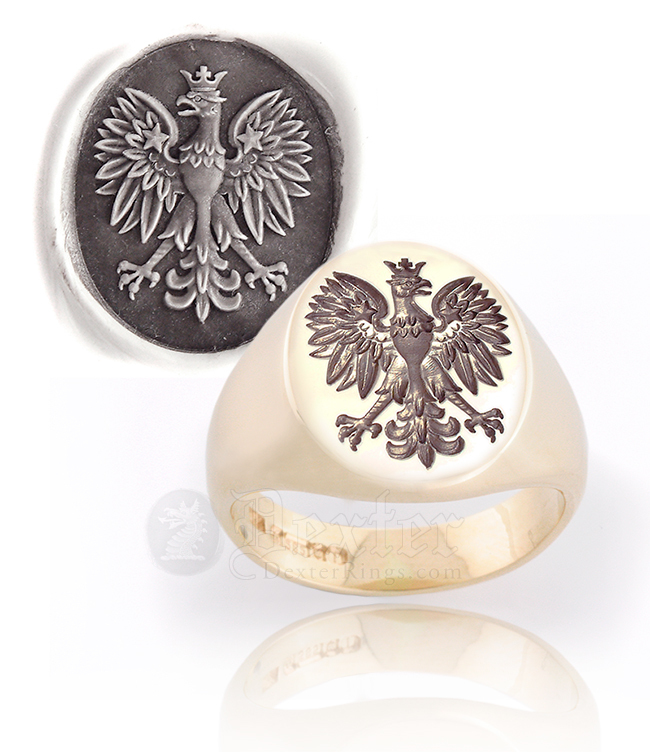 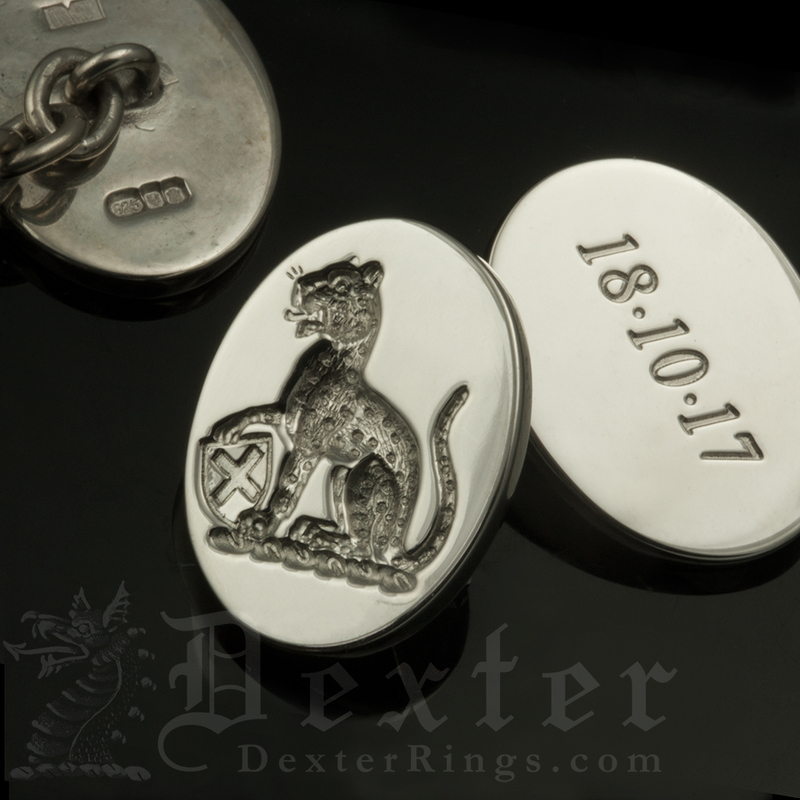 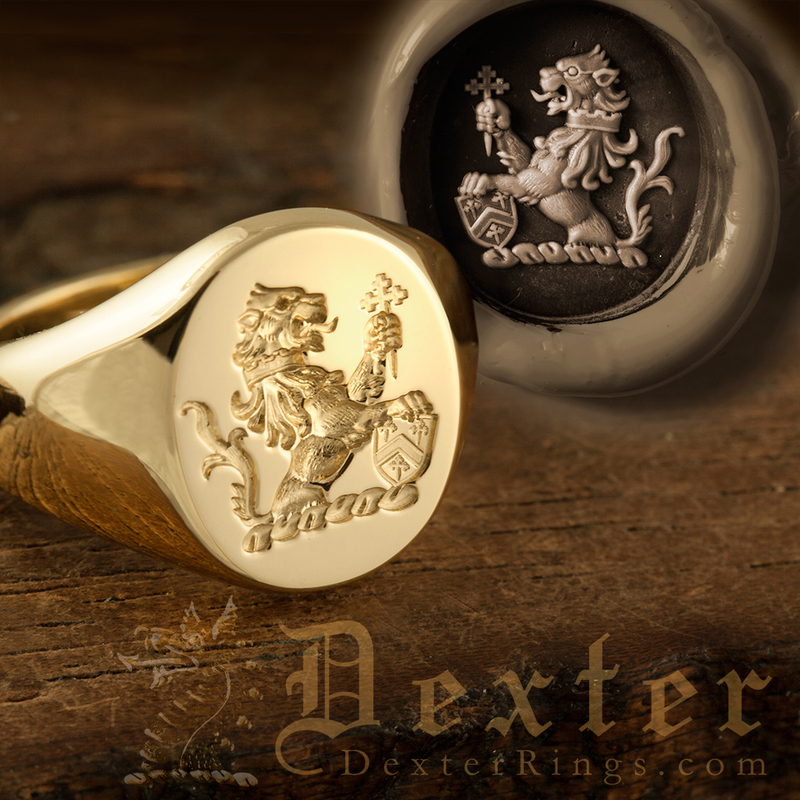 Below are example rings engraved with heraldic crests gold & silver rings available to purchase today with YOUR crest. 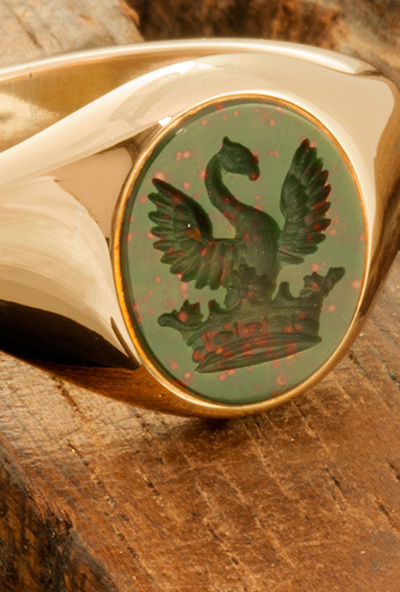 Despite what some people think, a crest is actually part of a coat of arms. 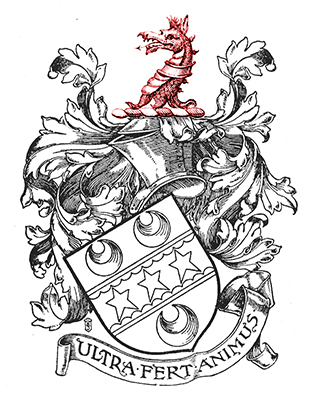 An example full arms is depicted on the left. 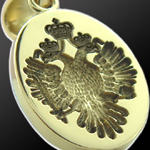 The crest, as the word suggests, like the crest of a bird, or the crest of a wave, is the top part of a coat of arms. 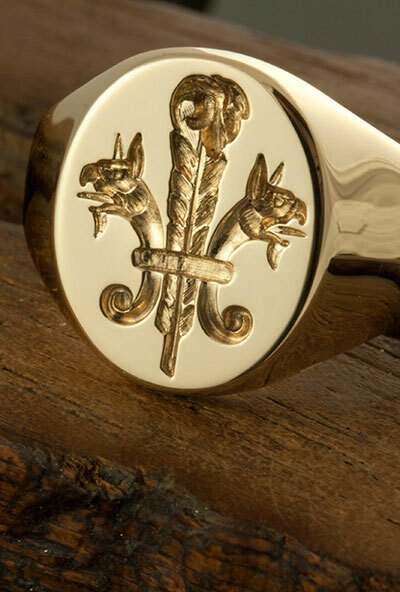 A crest is denoted by a wreath sometimes called a torse; this is the rope at the bottom of the emblem used to tie the crest to the helmet of the arms. 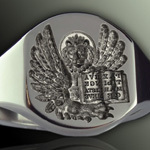 The crest may somtimes include a motto within a ribbon within the engraving. 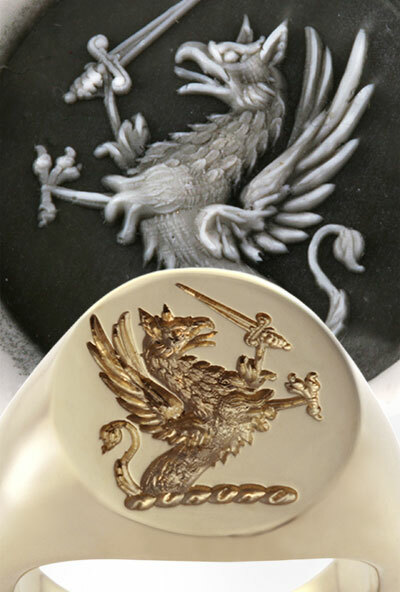 Heraldic beasts appear within a coat of arms; as the crest (top of the arms) within the shield (charge) and sometimes either side of the shield (supporters). 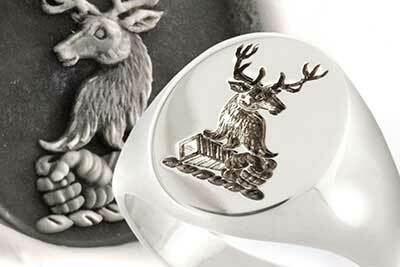 If a heraldic beast is depicted without the wreath generally it is a charge, taken from the shield of a coat of arms. 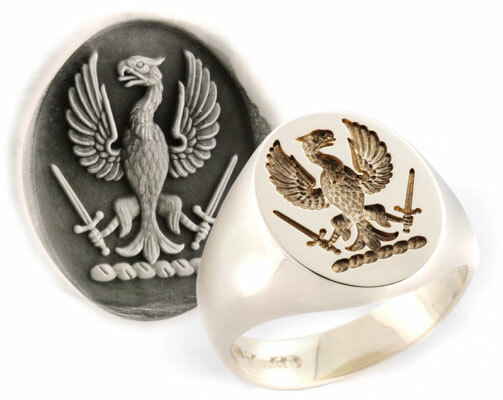 Heraldic eagles are a widely recognised symbols that has transcended pre heraldry into modern society. 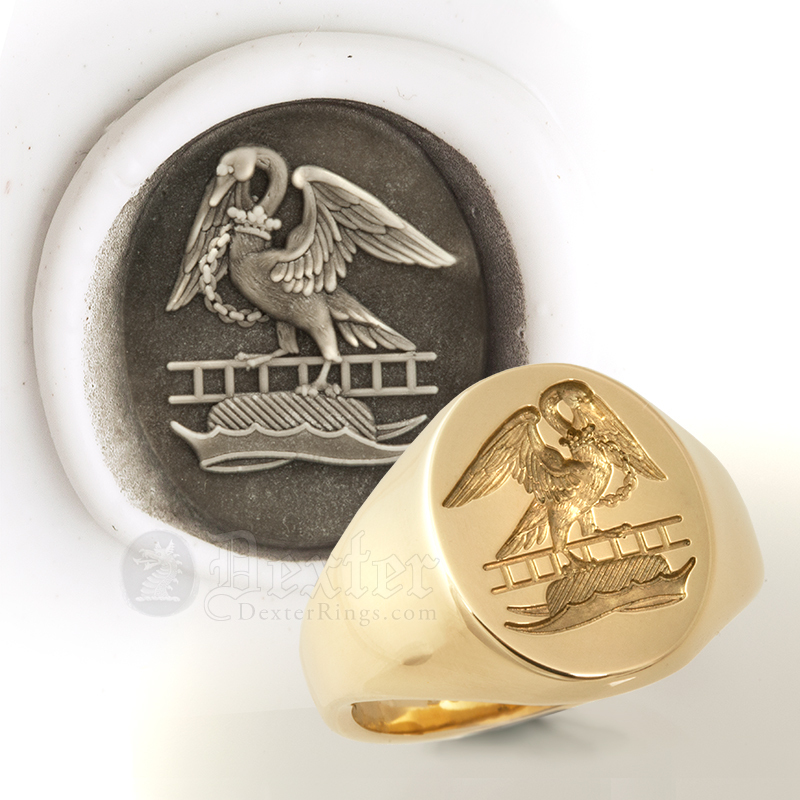 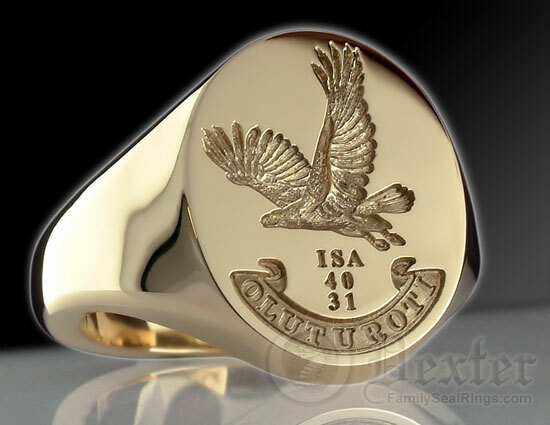 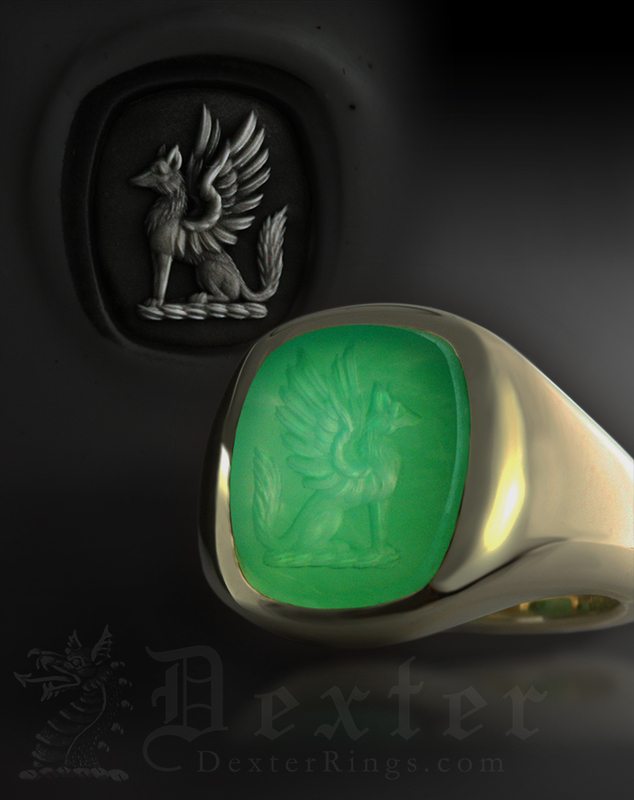 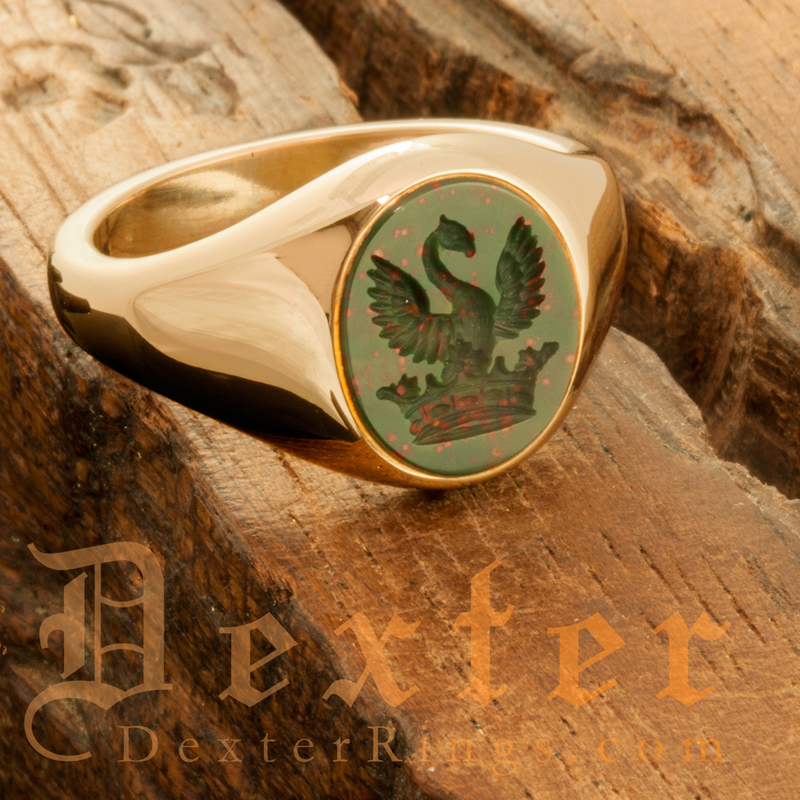 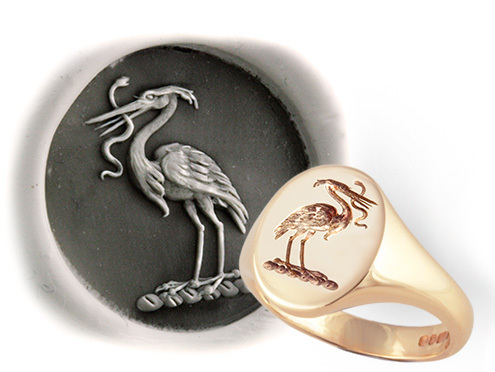 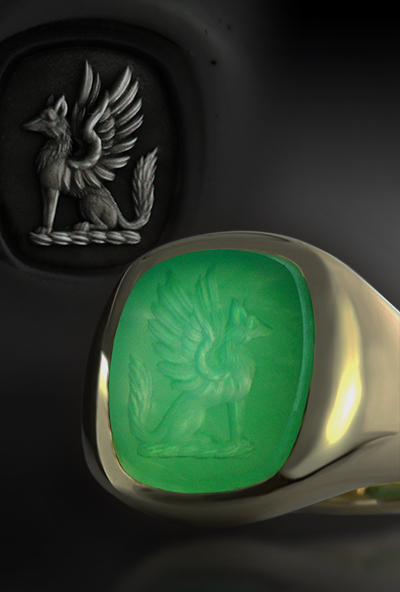 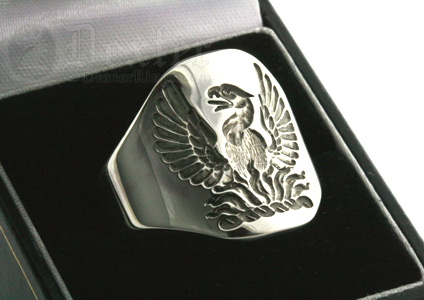 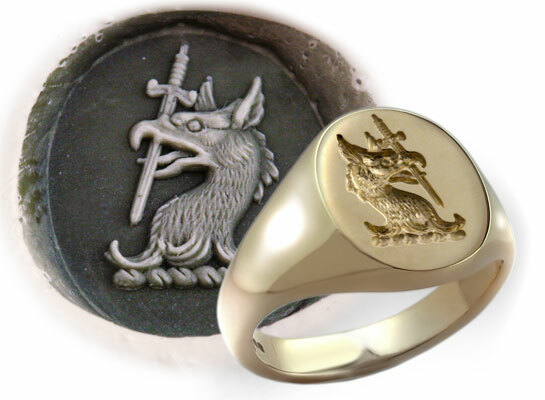 Pre dating heraldry (12th century), as a meaningful and evocative symbol, eagle signet rings were first worn by Ancient Egyptians and Greeks, and eagles were an important symbol in wider culture and society. 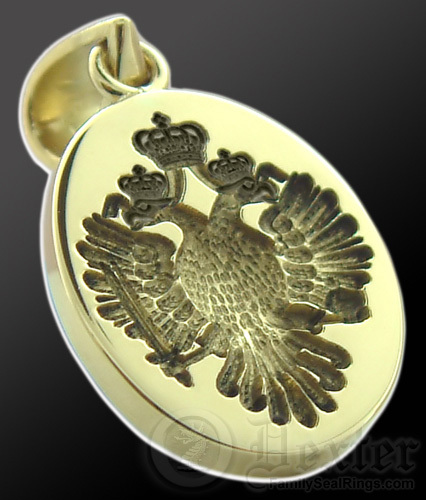 Symbolising; nobility, strength, bravery, and wisdom, the eagle has been adopted by religions such as Christianity to symbolise redemption, and espoused as a symbols of empire and nationhood by the Holy Roman Empire, Byzantine Empire, the German, Polish, and Russian amongst many others. 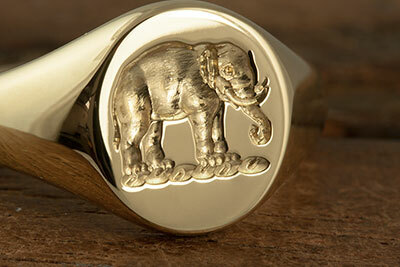 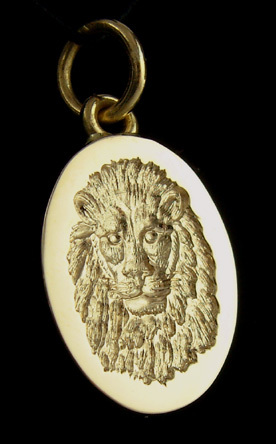 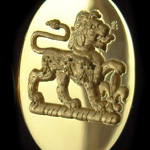 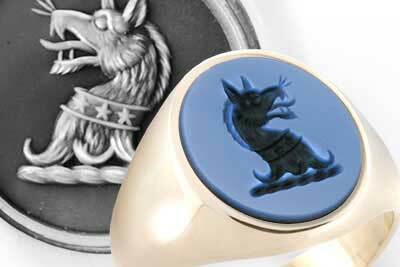 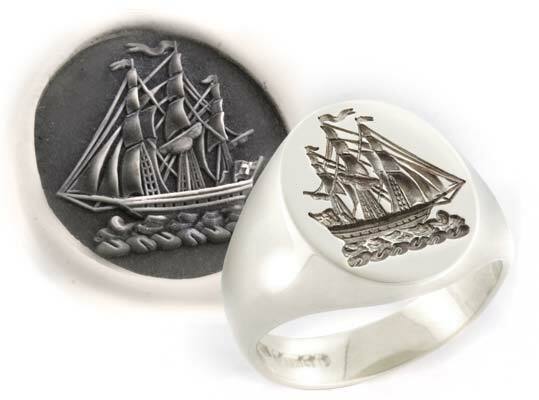 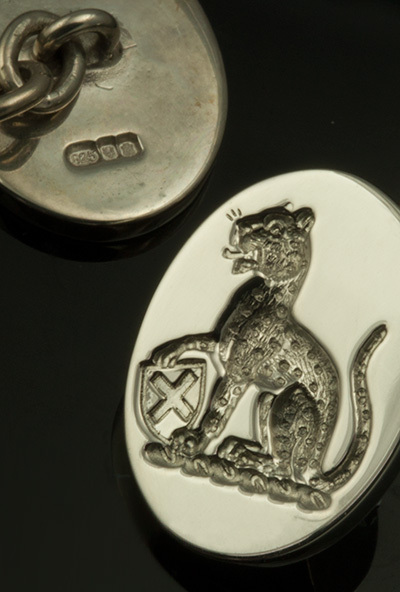 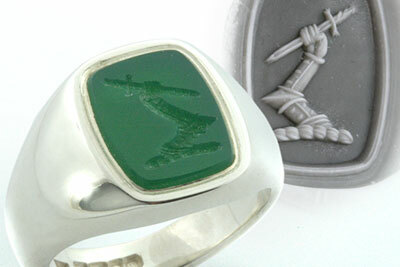 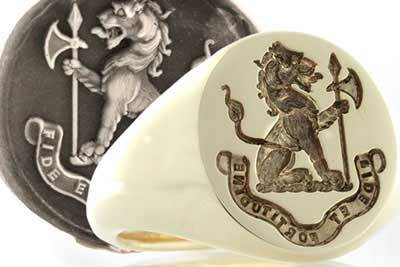 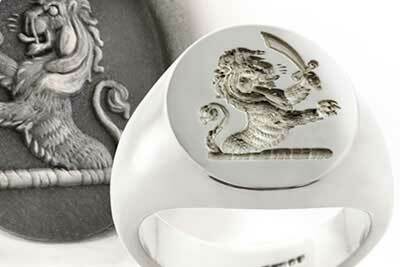 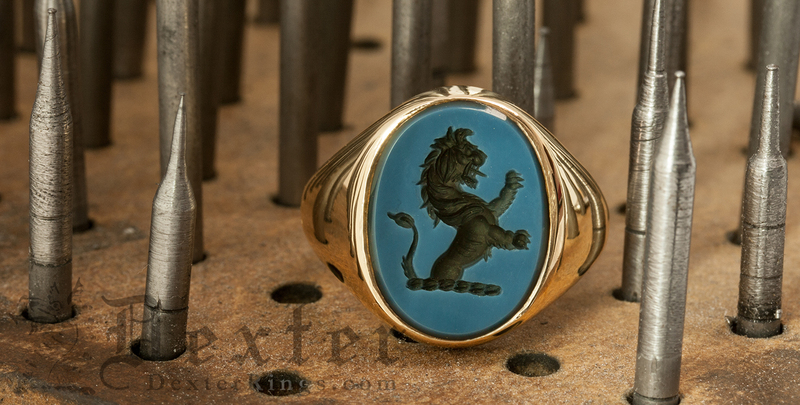 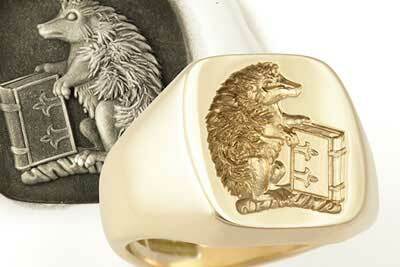 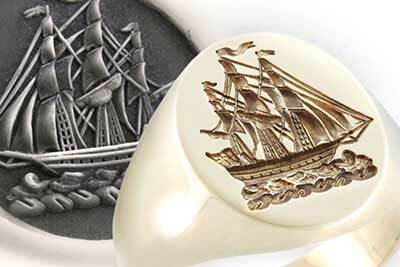 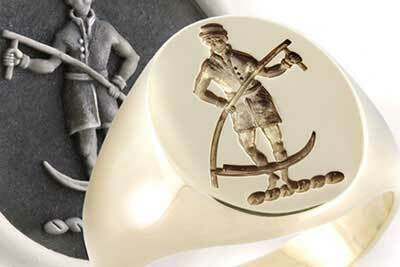 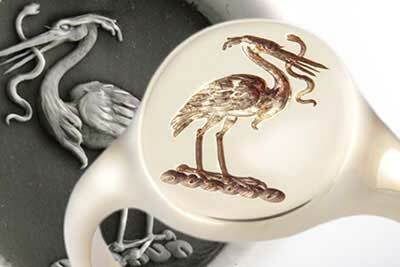 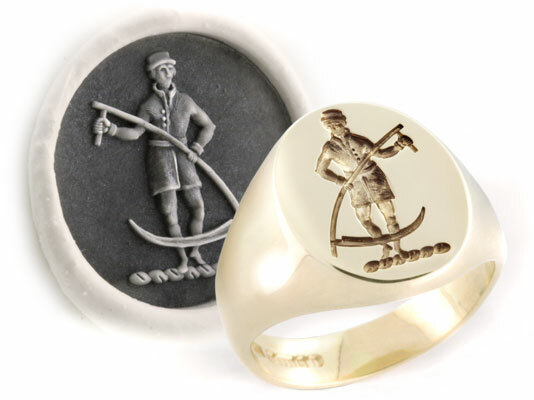 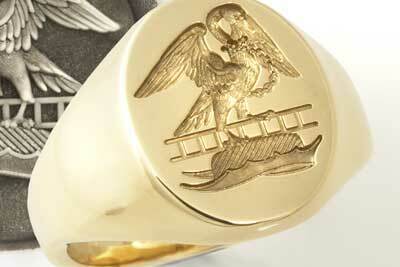 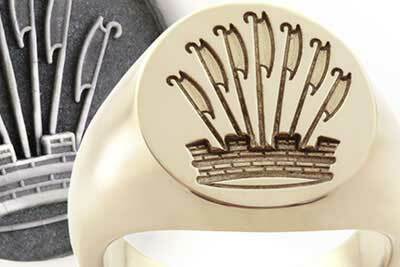 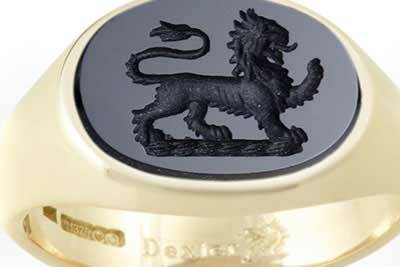 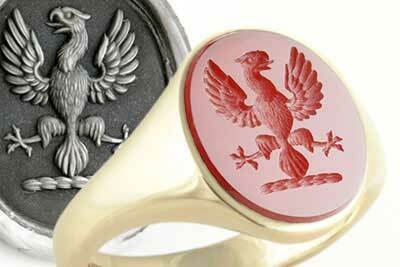 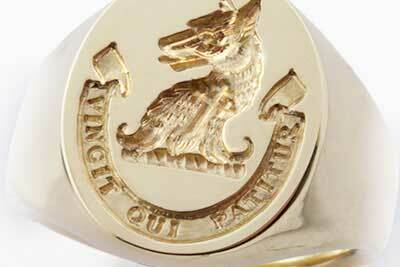 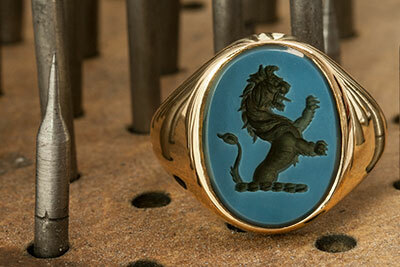 It is traditional for English families to have the crest engraved onto a signet ring often worn on the little finger. 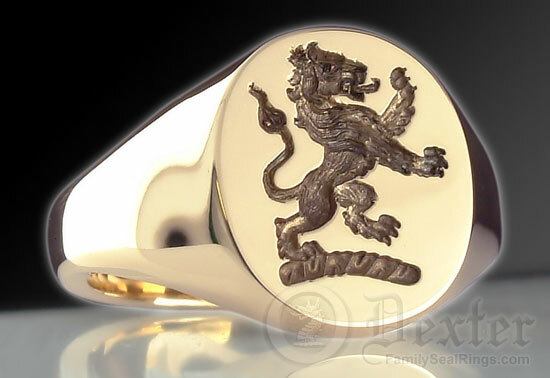 Because a ring worn on this finger would naturally be smaller than a ring worn on the ring finger it suits this important part of the heraldic arms. 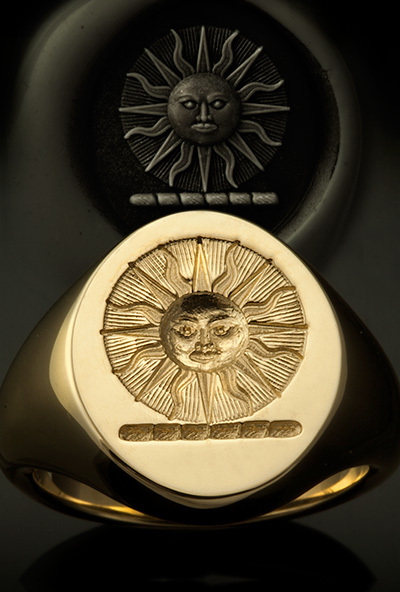 Due to tradition, these rings tend to be traditionally seal engraved (reversed) so the crest will face to the right on the ring. 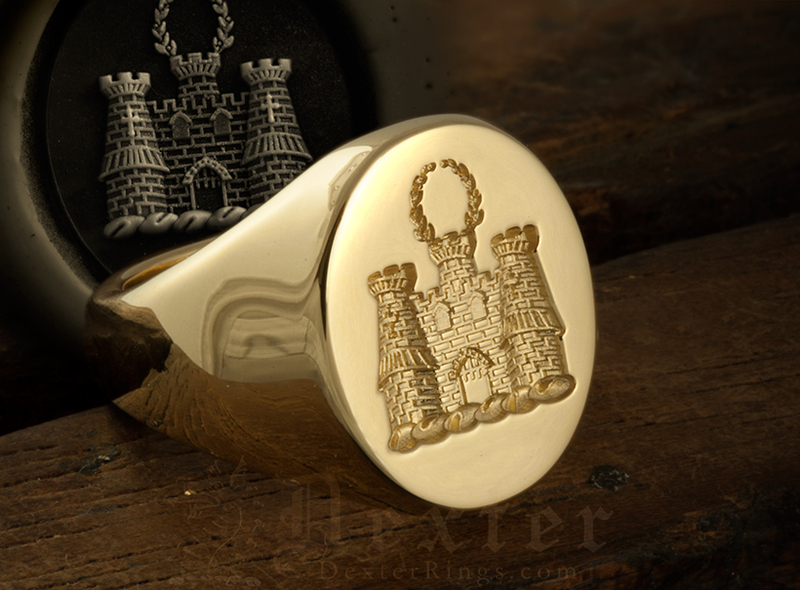 CHOOSE YOUR CREST RING. 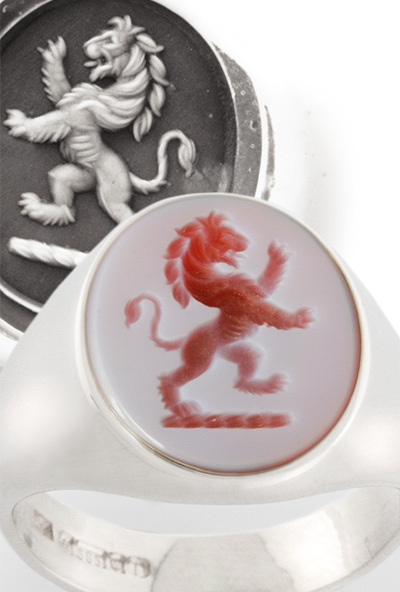 The heraldic Lion is probably the most recognised of all the heraldic beasts. 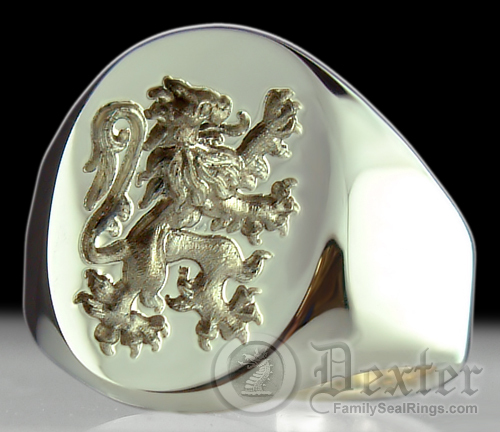 Used as a visual metaphor for strength and courage it is as poignant today when used in graphic imagery, as when it was first used in heraldry in the 12th century. 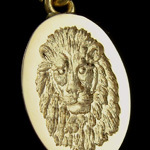 Found in the shield of a coat of arms (a charge), or as a crest denoted by the rope underneath the beast called a torse or wreath. 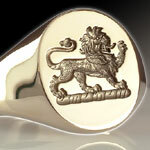 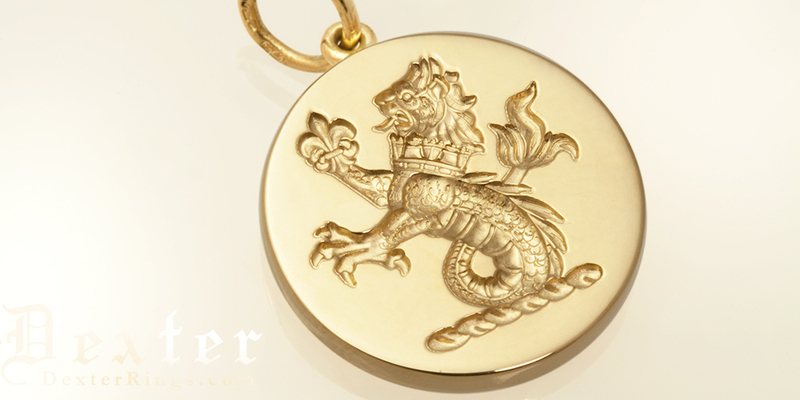 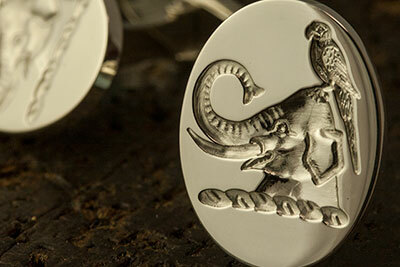 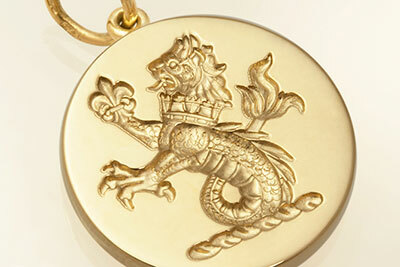 Today it is a symbol which still symbolises many family names, and an attractive image that is appealing to many. 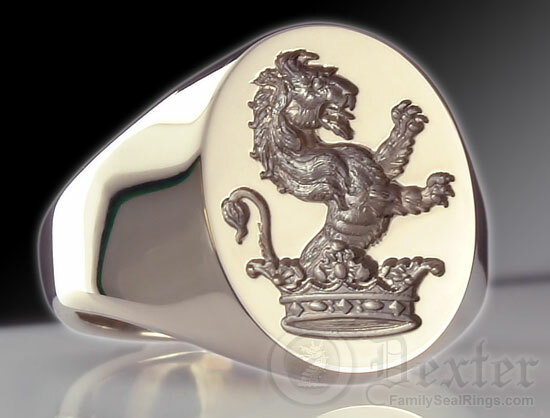 You will see heraldic lions depicted in different poses this is significant as in heraldry the posture of the lion is crucial to its meaning, the family it represents.